Daniella’s refreshingly authentic approach to both client interaction and courtroom delivery allow her to deliver results in an accelerated and cost-effective manner. 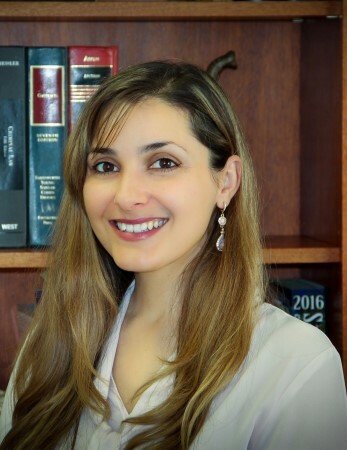 Though her expertise encompasses family law litigation and civil matters, Daniella also holds a track record of success in resolving numerous civil litigation and personal injury matters. From preparatory research to courtroom presentation, Daniella’s diligence, devotion, and comprehensive strategy allow her to continuously execute on what matters most: her client’s success. Daniella began her legal career in 2011 as a paralegal, where she built up experience and expertise on complex family law matters including prenuptial agreements, custody, support, property division, and more. Daniella’s experience in local law offices gave her a strong command of civil litigation and transactional work as well. Though her approach is to negotiate and settle whenever possible, Daniella’s client-centric mindset and passionate courtroom advocacy help her get results for her clients again and again. Born and raised in Europe, Daniella is completely fluent in Bulgarian. A passionate world-traveler, she enjoys seeing new sights and experiencing the fresh perspectives that different world cultures and settings provide. Additionally, Daniella enjoys cooking and spending quality time with her friends and family. Daniella earned her undergraduate degree in Political Science with Emphasis on International Relations from the University of California, Santa Barbara, where she graduated with high honors. Earning her J.D. from the Santa Barbara College of Law, Daniella graduated at the top of her class. She is admitted to practice before all Courts in the State of California and is a member of the State Bar of California and the U.S. District Court, Central District of California.